Populate your dashboard with content that's relevant to you, such as your favorite blogs, social services or essential tools, and create your personal corpus. Import an OPML file of RSS feeds you have already listed. Add websites or RSS feeds, one by one. If you have already used an RSS aggregator, you can easily import all your RSS feeds in one shot by importing an OPML file into Netvibes. Simply select your file and validate. The dashboard will refresh automatically with all your RSS sources. At any time, you can add new RSS feeds to your dashboard. Select the RSS feed of your choice and drag and drop it to your dashboard, or simply click on the + in the left corner of the app. Choose apps from our gallery that are relevant to you and add them to your dashboard. You can add an app by directly clicking on the + on its top left corner, or by dragging and dropping it. Play with the toggle to switch between both views. This view allows you to organize your dashboard app by app. There are 12 existing layouts. This view is the best way to read articles as it allows you to have an at-a-glance overview of all your feeds. Select the display option of your choice among the 3 available. The reader offers three different views: List, Expanded and Mosaic. The List view displays one line of all the articles. It is the most compact view. It is specifically useful for News tabs as it allows you to easily spot any article, even when you have a lot of sources. The Expanded view opens and displays all the articles. It is the most detailed view. You can read all the items of your tab by just scrolling your page. The article in focus is indicated by a green line on its left side. The Mosaic view displays a series of thumbnails of the main picture from the original post (when available). This is an ideal view for image focused content. Click on the image to display the content of the item. The Dashboard of Things lets you program the content of your dashboard. Simply create Potions by picking apps as triggers and other apps as actions. The first step lets you create a potion from existing ones. We have listed some potion examples for you to get an idea of the possibilities. Or, if you already know what you want to do, you can start from scratch. The second step lets you pick up the triggers and the actions you want the potion to execute. If you have selected a preset potion, the triggers and actions are automatically selected. All you will have to do is configure them. The third and final step lets you give a name to this new potion. Each potion is represented by an app on your dashboard. You can add as many triggers as you want. Depending of the you operator selected, the potion will execute actions if all conditions are triggered (All) or just one (any). 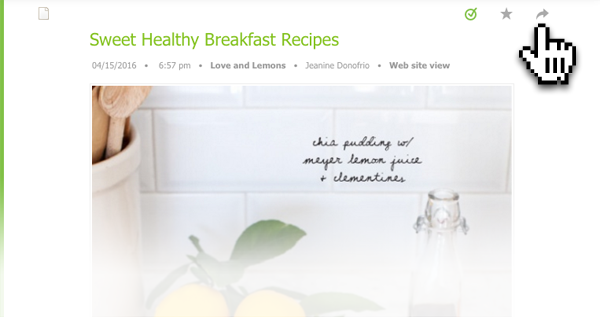 All Netvibes specific ingredients are colored in green. Each ingredient has at least one trigger. You can add as many actions as you want. Each ingredient has at least one action. Once you have created your potion, an app is displayed on your dashboard. Edit (1) lets you relaunch the Potion wizard to edit it entirely or just a small thing. Turn OFF/ON (2) lets you deactivated the potion without deleting it. Display (3) lets you switch the display of the app : summary or logs. If you delete the app, the potion will be deleted also. Now that you have built a dashboard for your own use, you can share any articles, apps or even tabs to your friends, colleagues or anyone. 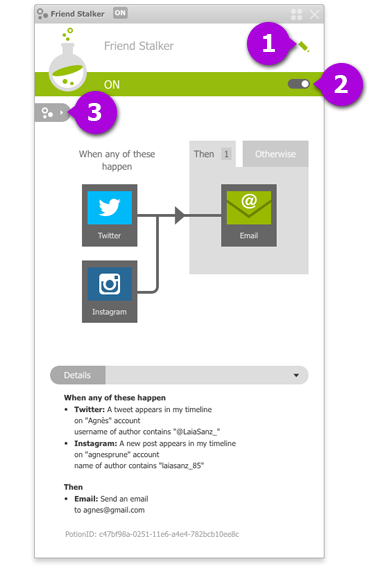 By default you can share by sending emails or by grabbing links. 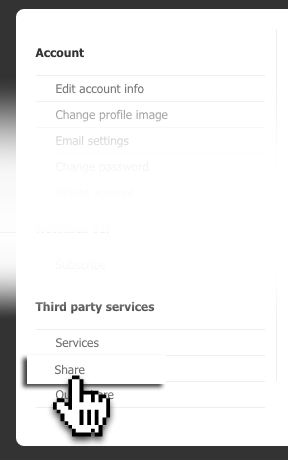 But you can also share by posting items directly on many web services. If you can't find the web service your are looking for, you can add it manually (3) by clicking on the Add a custom link button (4). Also, you can choose to share a link that directly leads to the article or a link that leads to a specific Netvibes share landing page (2). After making any changes, you have to click on the Save changes button (5) to validate them. Whether you are on the App or on the Reader view, click on the Share icon on the top of the article you are reading. Grab a direct link to the article. Click on the article's title or the double arrow icon to open the article on its website, or right click on it to copy its URL. Select the web service you want to share on. Click on it to display its web services panel. Send an email: click on “Or by email”, enter the email address of your recipients and a message of your choice. Click on the Cross icon on the top right hand corner of the panel or on the Cancel button to close the panel when you are done. Click on the Settings icon on the top right of any app, and select the Share menu. Send an email: click on “By email”, enter the email address of your recipients and a message of your choice. Publish on your page: click on “Publish on your page” to copy this app to another dashboard of yours. Grab a link: click on “Grab a link” to obtain the share link of this app. Select the web service you want to share on. Click on it to display their web services panel. Whether you are on the App or on the Reader view, open the Tab settings and select the Share button. 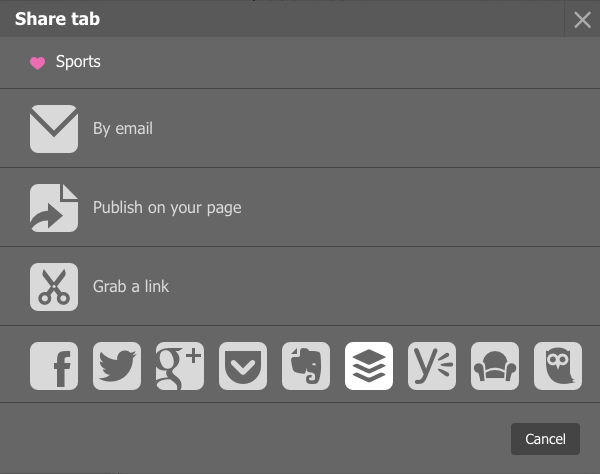 Publish on your page: click on “Publish on your page” to copy this tab to another dashboard of yours. Grab a link: click on “Grab a link” to obtain the share link of this tab. With a Netvibes account, you can have as many private dashboards as you need. Each digital life — home, work, family, and more — can live on its own dashboard, with its own theme, tabs and apps. To create a new dashboard, click on the Dashboards menu on the topbar. 1- Create a dashboard based on any topic by entering the keyword(s) of your choice. 2- Select one dashboard among our 12 pre-populated ones. Your dashboard is now ready. Click on the Dashboards menu on the topbar. 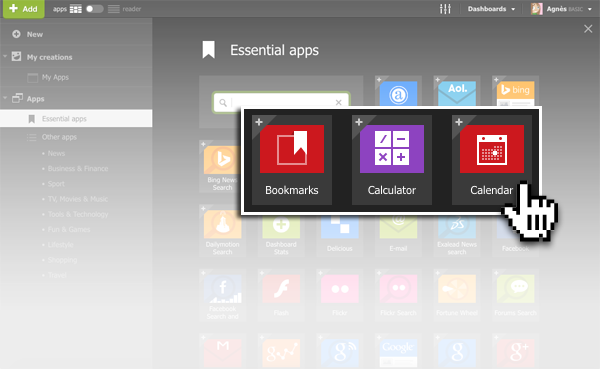 On this page, you can create new dashboards, reorder them or rearrange their tabs. If you have too many sources cluttering up your dashboard, use the Spring Cleaning feature to easily remove inactive or noisy ones. And look for the Spring Cleaning menu, at the bottom of the left panel. Check this page for details on all possibilities.